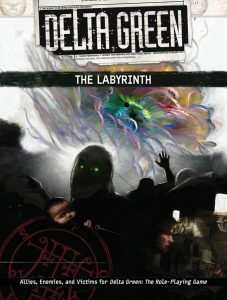 Delta Green: The Labyrinth takes Delta Green agents beyond the beltway and deep into the fissures of America in the new millennium. American life has entered a labyrinth of twisty passages all alike. And while there are many ways in, there is no way out. I interviewed John Scott Tynes about his recent turn back into tabletop RPG design and what makes this new book unique for Delta Green. If you think you would enjoy it, consider checking the Kickstarter out. As expected, there are a lot of good ideas here. The concept of the mythos as plutonium, leaking radiation to anyone who gets too close, has informed my games since I came across it. I think John Scott Tynes mentioned that idea in more depth on the Unspeakable Oath previously. So I definitely like the idea of escalation/desperation from cults and other threats once they are disturbed. The plutonium was buried underground, but now the Delta Green agents have dug it up..